Tamarack Resort revolves around outdoor snow activities in the resort community of Tamarack, Idaho. The resort offers a wide variety of dining options, luxury amenities including a spa and fitness center, and daycare for guests who want to enjoy a little free time. There is a wide selection of different lodging options for guests who stay at the Tamarack Resort. One of the largest and most upscale are the estate homes. These private estate homes sleep up to 17 people at a time and feature grand entertaining and gathering areas. They are located in mountain lots that are secluded from the main areas of the resort and offer views of both the lake and mountain peaks. Each estate home offers slightly different amenities, but they include a combination of features including fireplaces, decks, washer/dryers, hot tubs, and garages. All estate homes have a mix of bed sizes - king, queen, twin - in multiple bedrooms. Lodging can also be found at The Lodge, which is located at Osprey Meadows. The Lodge has traditional hotel rooms as well as condominiums and studio apartments for overnight stays. The building is just minutes from the resort’s central area. Guests can choose from either king or queen size beds in a variety of different set-ups. Each room at The Lodge has at least one full bathroom, and some of them come with washer/dryers, balconies, and gas fireplaces. Tamarack also offers townhomes for overnight stays. 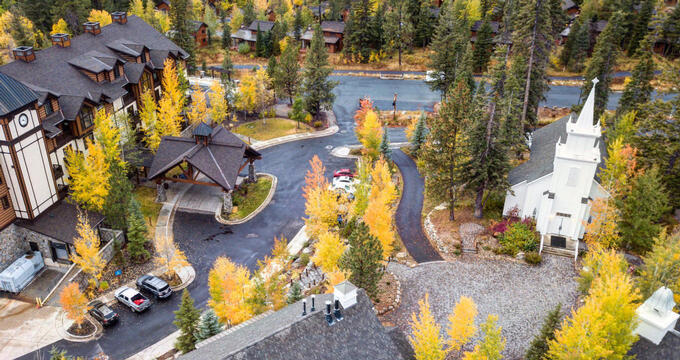 They have between one and three bedrooms (all with at least one king size bed) and are located in clusters along some of the resort neighborhoods and alpine trails around the property. These townhomes have standard features like entry-level kitchens and dining areas, stacked washer/dryers, fireplaces, hardwood floors, and hot tubs (in some units). Guests can also choose cottages for their overnight stays. All cottages are over 1,000 square feet in size and have two bedrooms and two and a half bathrooms. Each of these cottages has their own, private hot tub, fireplaces, and washer/dryers. An additional overnight option is a stay in one of the Tamarack Resort chalets. These chalets can sleep as many as 12 guests at a time in their three or four bedroom lodging, which can be as large as 3,000 square feet. Each chalet comes with a fireplace, private hot tub, detached garage, and wrap-around deck. The master bedroom features a king-sized bed, which each subsequent bedroom has either a queen or two twin size beds. Tamarack Resort features optional heated, underground parking for guests. All guests staying overnight at the resort will receive two “Tamarack passports” per room, per nightly stay. These passes give guests access to amenities around the property, which change depending on the season the guest stays during (winter or summer). Winter passports include an overnight hot wax, lift ride ticket, snowshoe rental, and a Nordic trail pass. Summer passports include a life ride ticket, a cruiser bike rental, kayak rental, beach chair and umbrella rental, a disc golf rental, and a fishing pole and tackle rental. Another amenity offered by the resort is daycare. Daycare is available for children between the ages of 6 months and 7 years old in both the winter and summer months. Activities are structured according to the season and include a variety of games, crafts, books, and movies. Nutritious meals are also served. Other resort amenities include a large, outdoor hot tub open year-round, a seasonally open (May through September) sizeable outdoor swimming pool, locker rooms, a fitness center, and a spacious lobby that provides guests with free wireless internet access. There are multiple dining options for guests at the Tamarack Resort. Guests can choose to dine at Fern and Feather, which is the newest restaurant at the resort. This comfortable yet upscale dining experience is located in The Lodge and is the only restaurant on the property to accept reservations. It is open Fridays and Saturdays only. For a more relaxed atmosphere, there is the Seven Devils Pub. The pub has a full-service bar, seating both indoors and outdoors, big screen televisions, and a fireplace. The pub is open for breakfast, lunch, and dinner and serves brunch, a traditional pub menu, and a selection of craft beers and cocktails. Seven Devils is open seven days a week. Guests who enjoy coffee can stop by Hot Shots Coffee Bar. Open daily; the coffee bar serves up a selection of organic teas, espresso drinks, freshly brewed coffee, and natural juices. They also offer a choice of fresh fruit, pastries, and grab and go savory and breakfast options. Heartier options are available at the Canoe Grill and Vertical Bar. The restaurant offers a menu of traditional American options like burgers, soups, chilis, pizza, salads, and optional cocktails, wine, and beer. Guests also enjoy their signature Bloody Mary. A final option for guests is the Mile High Cantina, located in a unique yurt setting. The cantina offers a menu full of both tacos and tequila, and guests can dine there weekends and holidays only. Tamarack Resort also offers a full-service spa. The spa provides guests with multiple massage options as well as energy work like Reiki. It is open on Fridays and Saturdays and offers specials as well as therapies lasting 30, 60, or 90 minutes per session. The spa both accepts and encourages reservations. The resort offers many different outdoor snow-related sports and activities. Guests to the resort can enjoy Nordic skiing, snowshoeing, snowmobiling, and ice skating. Many of these activities are included as part of the winter passport that guests receive for an overnight stay at Tamarack. Guests visiting in the summer will not find themselves at a loss for activities, though. The resort offers whitewater rafting, mountain biking, hiking, zip line tours, and boating and paddling options. A majority of these activities are also included in the summer passport as well. For guests visiting the resort without much experience skiing, Tamarack offers different options to help each resort guest have the safest and best time while visiting. One of those options is the Tamarack Sports School. The school offers all-ages classes for experience levels child to adult. They also offer either private or group lessons. Longer staying resort guests can let their children take advantage of the resort’s Trailblazers program, which is a multi-week program for children between the ages of 4 and 12.